As you may have noticed from my last update, I have spent a lot of time thinking about how to apply what we learn from studying football stats. How do you take academic knowledge and make it practical? What feedback do we get from talking to players and coaches about how to better apply these ideas in the future? What simply does not work? I cannot stress enough that the world is just getting started in this area. What we understand and think is correct now may dramatically change over the next 20 years, but you do the best with what you have. Progress is a bumpy road. What follows is a goofy idea I was fooling around with some time ago related to developing player skills in ways that are intuitive, especially to younger players. The concept here is that coaches could introduce this, and coach a couple of brief sessions on proper usage and technique, and then players could then use this as part of their free development time to help improve skills. Confession: It might be dumb for reasons I have never thought about but many of the coaches out there have. Here’s the rub… that’s fine! Experimenting with concepts and ideas is one of the most important things new people can add to the game. Plenty of potentially bright ideas won’t work out for , but many of those interim steps might be required for something truly brilliant. The other thing I am fairly certain teams do not do enough of is learn from their training information and data. Game data only takes you so far. Being able to objectively evaluate your own players based on training drills from the first team right down through the academy is a hugely valuable resource that can’t be replicated in any other way. The ideas below were me poking around with developing an environment where that became fairly natural. 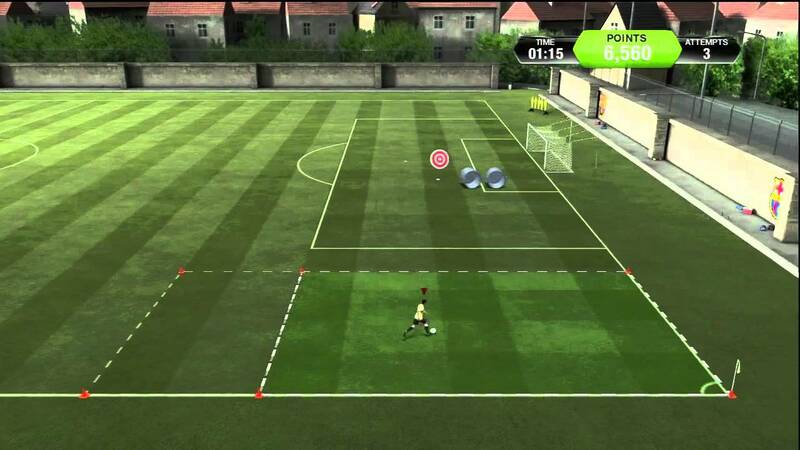 You know the FIFA skill drills that help teach you how to perform certain drills in the game? Let’s adapt those and use them for objective performance and skill tracking. The concept is to create a pitch with different areas designated to different types of skill drills. At regular intervals, coaches/analysts track player performance in the various skills and update the skill leaderboards. Game data only generates a very small sample of information about certain important skills. Example: In order to find out who the best shooters in the world are, it can take from 3-5 seasons of data to tease out whether a player is good versus lucky with regard to shooting skill. For skills like long shots, free kick taking, or corner taking it could potentially take even longer to discover this information. However, by starting to track data in training for skills we care about, we can rapidly overcome the small sample size problem and learn in a matter of months what it might take years of game data to discover. We can also tailor player roles better to personnel who actually have the skills we want. And finally we can start to track player improvement in these areas objectively. Better evaluate our own players by creating data driven metrics that teach us more about player skills than we would learn from small sample sizes of game data. Post regular leader boards with player rankings across all levels, so that players are incentivized to compete and improve. Eliminate on-pitch arguments about who gets to take free kicks or corners or penalties or whatever (Note: This actually happens!). Point to the data, and that person takes it. Want to take more free kicks yourself? Get to the top of the leader board. This should help foster an environment of continued skill work and improvement at all team levels. Increase player buy-in by creating skill “games” directly related to one of the world’s favourite player past times – playing the FIFA video game. Decay data over time so that players can move up or down the leader board by showing continuous improvement. If this pitch gets a high amount of use, you might consider developing it on turf, because the free kick and corner locations especially will get chewed to bits. How? 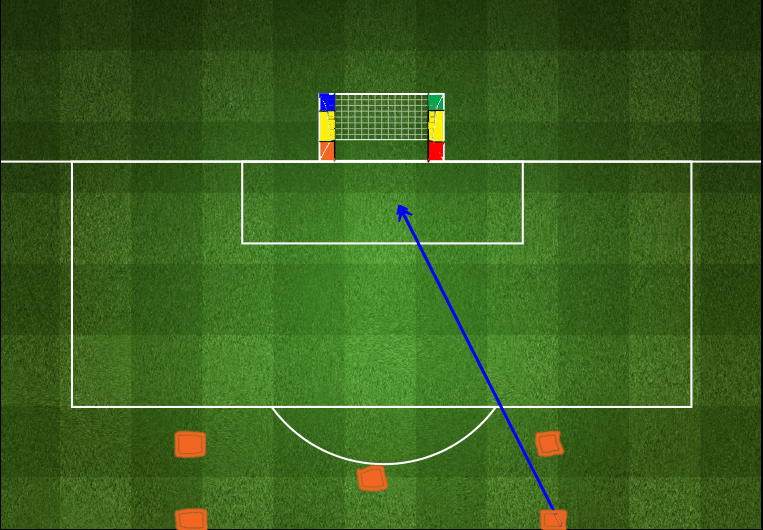 For free kicks, pick 5 spots on the pitch (Example: central, 22 yds, Right 20, Left 20, Right 26, Left 26). 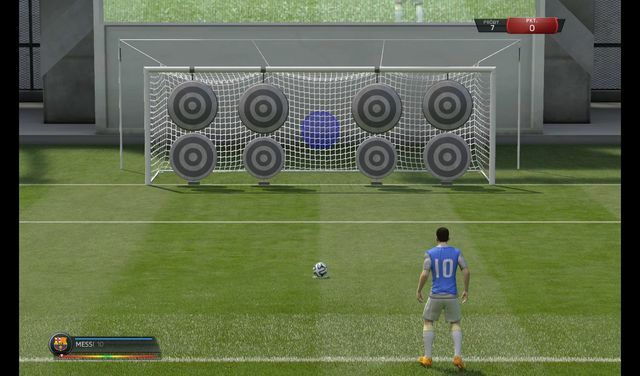 Add two 1-yard wide targets from top to bottom of the goal on each side (make sure they are color coded different colors, since it makes it easier to remember and for the brain to process) plus elevated wall simulations. If you want to maintain the ability for guys to keep practicing and move up and down the leader board (and the on-pitch FK taker roster) then have data expire after a certain amount of time for leaderboard purposes or weight the newer data as more important than the old. Also look into mixing in actual team practice with keepers and walls and tracking that at a less frequent interval to mimic in-game situations. One of the things we might learn here is that certain guys are just better at converting from certain locations and we can use that for in-game decisions. Do something similar to the free kicks except for corners. Set up elevated targets (or rubbish bins, if you want) at the different locations and heights you want your corners to land in and track the performances twice a week from each side. Obviously there is some subjectivity to the evaluations – this guy hits it harder, or flatter on corners or whatever – but now coaches have actionable information on player skills, and the analysis team has more info to help evaluate the ability and importance of players in the team. Use the same targets as the free kicks except add a large target centrally as well (Insert important game theory point about slow central penalties here). Alternatively, you can literally just recreate the target setup from the video game. When available, you can use players and defenders here for more realistic simulations.